At one time not so long ago, Brits used to fly out to Spain or Greece for a cheap holiday (see cheap self-catering holidays in Spain). Since the advent of the Euro, these are now expensive destinations. The fall in Sterling means that our money does not buy us as much foreign currency as it used to. Where can one still obtain a cheap holiday? Rising oil prices have made travel more expensive and airlines have reduced the number of flights to cope with the fall in demand. It is still possible to obtain reasonably priced flights to many destinations if you travel in times of low demand. This means that school holidays are out of the question. There are still quite a few cheap holiday destinations abroad where our money goes a long way. Eastern European countries that have not yet converted to the Euro are still reasonably cheap in terms of living and accommodation. Avoid large hotel chains and look to the B&B or 'rooms to let' market and you will find plenty of budget priced accommodation. 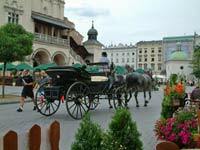 Countries such as Poland, Hungary and Slovakia have a lot to offer the holiday maker. Poland, for example, is a large beautiful country with the coast and seaside resorts in north, mountains and alpine scenery in the south. In between lie hundreds of acres of woodland, lakes, rivers and open countryside. Rooms to let in Poland are called 'noclegi' and are usually on a Bed and Breakfast or room only basis. A small number of holiday rentals in Poland are also available. These tend to be apartments in the large cities such as Cracow, Warsaw, Wroclaw and Gdansk; all fascinating places to visit. Holiday rentals in Eastern European countries are also very reasonably priced should you wish to rent a house or chalet for your family, or share with friends. Another way of obtaining a cheap holiday abroad is to enrol in a holiday home exchange scheme and contact members in countries of interest to you for an exchange. Some of these schemes involve the exchange of holiday homes, others of swapping your ordinary everyday home. Bill Bryson once said "I can't think of anything that excites a great sense of childlike wonder than to be in a country where you are ignorant of almost everything". It is good to explore.